Prioritize sleep. This one is obvious – you need to get enough sleep each day. It is important to get quality, restful sleep that lets you awaken refreshed and alert. Cut down on avoidable activities such as late night TV viewing or internet surfing and ensure that you get to bed at a reasonable time every night. Minimize disturbances and use blackout drapes to prevent yourself from waking up too early in the morning. Take frequent breaks, vary tasks. By varying the type of work you do, you keep your mind from getting bored and fatigued. If you take frequent breaks this also prevents the ennui that settles due to the repetitive or unceasing nature of your work. Getting up and moving around frequently or doing a few simple exercises at your desk also helps improve blood circulation, which is something else that will help prevent tiredness. Watch what you eat. 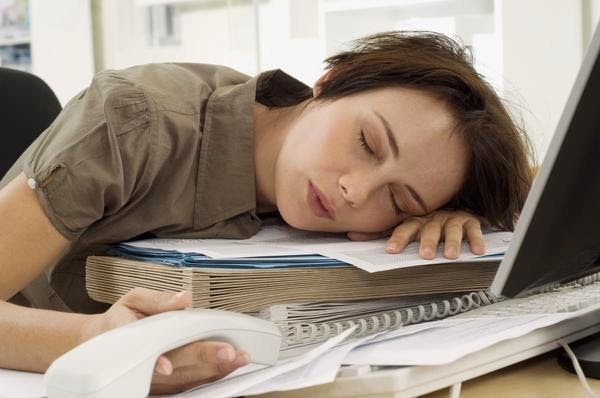 Studies have shown that your food and beverage choices could impact workplace tiredness. Ensure that you have breakfast and don’t skip meals so that your body gets good source of energy. Drink plenty of water to keep your body hydrated but pass up on sugary, caffeinated drinks. Ensure that your lunch has a good balance of protein and carbs, but not so heavy that it makes you feel too full because this will make you feel sleepy after. Lower stress. There could be work issues or lifestyle issues that create stress and this can add to how tired you feel during your working hours. Examine if there are personal issues you need to address or if there are issues in the workplace that are contributing to your stress levels. Speak to an office personnel or an HR person to sort out issues that could be contributing to your stress. It may also be a good idea to learn relaxation techniques to lower stress. Keep active. Regular exercise has numerous benefits including keeping the body healthier, helping fight infections, upping the metabolism and giving the body more energy throughout the day. Get a health checkup. In some cases, the fatigue could be caused by an underlying medical condition. If the fatigue you feel is extreme or persistent, you may want to consult a doctor for some medical investigations. Ideally, you should do your best to improve your workplace environment, which can definitely contribute to lowering stress. Making a few positive workplace and lifestyle changes can help to accomplish that. To keep getting updates of interesting posts such as this one, or to find out more about how you can save on your office supply expenses like ink & toner, subscribe to our newsletter and like us on Facebook.